You’ve been to Tokyo/Osaka/Kyoto one too many times for the Sakura festivals, and as beautiful as they are each time you visit, here’s us telling you it’s time for a new location. We have whipped up a list of unique and rather unseen Japanese destinations and beautiful HomeAways in and around them for an extraordinary sakura viewing this year. Fukuoka is a great place to add to your list of places to visit in Japan if you’re thinking of unusual viewing spots . The sakura season arrives early in Fukuoka, as compared with the rest of the Japanese cities. Here are the top places in Fukuoka for some unforgettable cherry blossom viewing moments. Accessibility: Fakuoka is accessible from Tokyo by bullet train (5 hours). With an attractive view of Hakata Bay, has been named as one of Japan’s Top 100 Cherry Blossom Spots and there is little doubt why. Nishi Park is home to around 1,300 cherry trees of different species – weeping cherry, Oshima cherry, and mountain cherry – among others. Home to close to 1,000 marvelously blooming Yoshino and weeping cherry trees, this park is one of the best sakura viewing spots in Fukuoka. The park offers a unique sakura viewing experience with a historical backdrop since it is home to the ruins of the Fukuoka Castle. Originally built in 1602, this castle was rebuilt in 1959 after it was destroyed in a fire. The castle grounds are known as the Katsuyama Park, that is a famous sakura viewing spot. The 14th Kokura Castle Sakura Festival will be held here from 31 March to 1 April, 2018. Generally, by the time sakura makes an appearance here, the plum blossoms are on their way out; but if there’s too cold a winter, the plum blossoms bloom a little later. So if you’re lucky, you can witness the simultaneous blooming of plum and cherry trees. Now that’s one spectacular twosome! This huge park is a favourite among locals to enjoy abundant sakura amid a calm, natural environment. The park is home to around 4,000 cherry trees. Most of these have been planted around Sakura Pond located in the center of the park. This comfortable two-bedroom HomeAway is perfect for a family of four. The host is also known to be extremely accommodating and is happy to suggest local favourites! Dressed in simple yet elegant décor, this one-bedroom apartment is perfect for small families looking for a home away from home. Situated close to parks, shopping malls and subway station, this cosy HomeAway will ensure your sakura viewing in Fukuoka is hurdle-free. Known for its cultural importance and natural beauty, Hyogo Prefecture is the perfect place to get a peek into Japan’s history and soul. The scenery receives a facelift during spring when thousands of cherry trees bloom across the prefecture. Accessibility: Hyogo is located very close to Kyoto and is accessible by train or road. Here are the best sakura viewing spots in Hyogo. Apart from being one of the largest castles in Japan, Himeji Castle is also one of the top 100 places to view sakura in Japan. The blushing pink colour of the cherry blossoms against the shiny white of the castle is a breathtakingly beautiful site. This huge park is every nature lover’s delight, especially during the cherry blossom season. The park’s close to 1,000 cherry trees loaded with delicate pink flowers around a pond form the perfect backdrop for Insta-worthy photos. Home to around 500 cherry blossom trees along with many adorable animals, the Oji Zoo in Kobe city is a must-visit when you are in Hyogo. There is an amusement park and zoological science centre to keep your children occupied while you enjoy the beauty of cherry blossoms along the paths. We recommend that you avoid weekends if you want to skip the crowds. Shukugawa Park is yet another place that found a prestigious place on the list of the top 100 cherry blossom viewing spots in Japan. 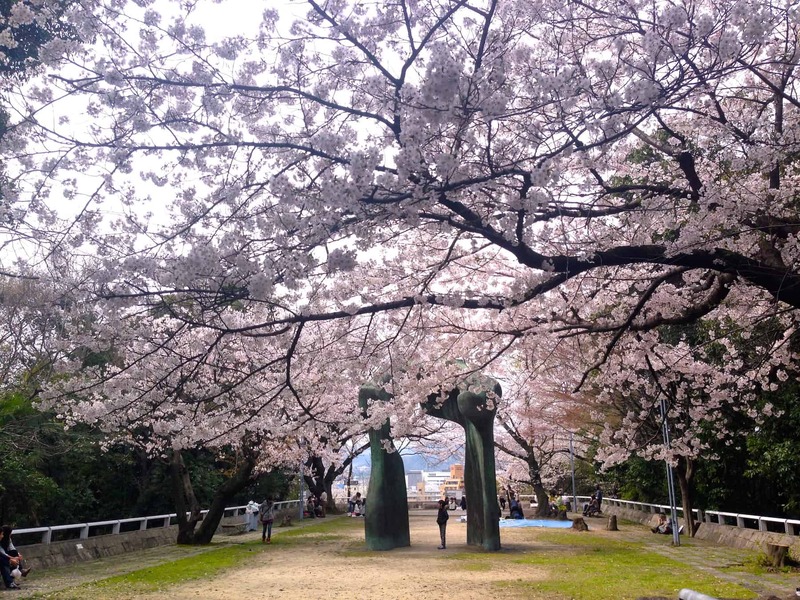 This park is considered as one of the best spots in the Hyogo Prefecture to enjoy sakura, thanks to the serene Shukugawa River flowing under a canopy of cherry blossoms. Book yourself into one of these HomeAways, so you’re not too far from these fantastic sakura spots. This well-kept HomeAway is perfect for those travelling in groups. This can be your perfect base for sakura viewing as it is close to subway stations. For those to want to explore other places, Chinatown is close and Universal Studio Japan is only 30 minutes away by bus. Located just five minutes away from Kobe station, this well-designed home is perfect for a fulfilling sakura viewing trip. Kanagawa Prefecture is the perfect blend of old and new. This historically important prefecture in the southern Kanto region is bestowed with diverse natural beauty – from rivers to mountains. Kanagawa is loved by locals for the variety of outdoor activities and sakura viewing. Accessibility: Kanagawa Prefecture is only an hour away from Tokyo. A trip to the Odawara Castle is like stepping back into time to view the beauty of sakura. This majestic family home of the powerful Hojo clan is a favourite spot among locals to watch cherry blossoms. This picture-perfect sakura viewing spot will stay in your memories long after you are back from Japan. Over 800 cherry trees in full bloom along the serene Ookagawa River is a sight to behold. Don’t miss The Ookagawa Sakura Festival generally held at the start of April around the river, marked by street food stalls, live events, and loads of entertainment. This massive Japanese garden is an ideal spot if you want to enjoy sakura in solitude. With over 300 blooming cherry trees and multiple historical buildings in the backdrop, Sankeien Garden promises an evening to remember. While you are there, don’t forget to try a variety of teas and sakura specialities. This stylish and conveniently located HomeAway has a view of a huge cherry tree! The apartment is dressed in white, red and black is located close to subway stations, malls, and Chinatown. A trip to Hiroshima generally proves to be an inspirational one. This historically and culturally important prefecture in Japan has proved to be an ideal example of rising above the situation and succeeding. While Hiroshima is known for its museums, gardens and castles, when spring comes, Hiroshima covers itself in a blush pink veil of pretty sakura. Accessibility: Hiroshima is accessible by bullet trains from both Osaka and Kyoto (around 2 hours). A five-story tall castle, a moat and over 400 cherry trees in full blossom. Of course, you can also enjoy a deep tête-à-tête with nature or spend quality time with your friends and family under a cool canopy of sakura. One of the most attractive tourist spots in the entire country, Miyajima is home to around 1,500 cherry trees. This small island close to Hiroshima, where tourists generally go to see the calming Itsukushima shrine and its torii gate, offers multiple sakura viewing experiences with calm corners and buzzing streets. However, it is said that the best views can be soaked in from the Tahoto two-storied pagoda. This park is the perfect sakura viewing spot for you if you want to view cherry blossoms in full bloom sitting right in Mother Nature’s lap. The park, famous for its shrine, is located on Mt. Daiho. The sight of around 1,500 blooming cherry trees combined with the mesmerising view from the mountain is a memorable one. This bridge during springtime looks exactly like a beautiful Japanese postcard, thanks to the 3,000 blooming cherry along the banks of the river. With five wooden sections, this conveniently-located bridge is perfect for photographers wanting to capture the beauty of sakura on a calm morning or during an auburn sunset. Perfect for fun hanami parties with family and friends, this park on a hill has over 1,300 cherry blossom trees spread across. With city views in the backdrop, sakura viewing in this park is a joyful experience. Located a short distance away from Hiroshima Station, book this luxurious apartment for its ample sunlight, pretty interiors and convenient location. This spacious and well-maintained HomeAway is close to tourist spots, convenience stores, and restaurants.